➤1/4″ compact sized ratcheting screwdriver is perfect for your use in confined space and close quarter. 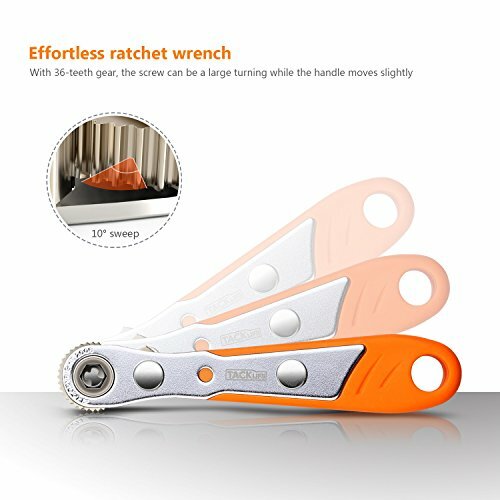 ➤Upgraded 36-teeth reversible ratchet system delivers smooth ratcheting and precision adjustment. 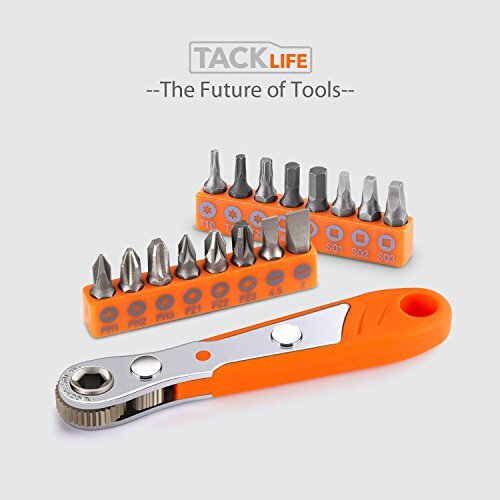 ➤The magnetic hex bit holder can securely hold bits in its position while you tighten or loosen your screws. ➤Come with extra 16 popular-size bits in a good organizer, it can save your time and money. ➤Each bits organizer are stamped with the bits type, make it easier for you to find and organize them. ➤The orange color is eye-attaching and easy for to get it in your tools box. 1.Blade must bottom in slot and tool must be held plumb. 2.These are mini ratchets and bits, so they’re not intended for high torque applications. 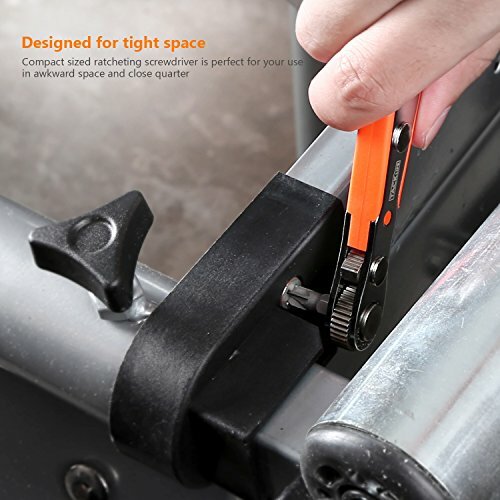 3.The thickness and width of the bits blade must correspond exactly to the screw slot.▲【Compact & Lightweight】 Pocket mini size with 4-inch long handle and 3/8- inch thickness is perfect for confined places and close quarters. 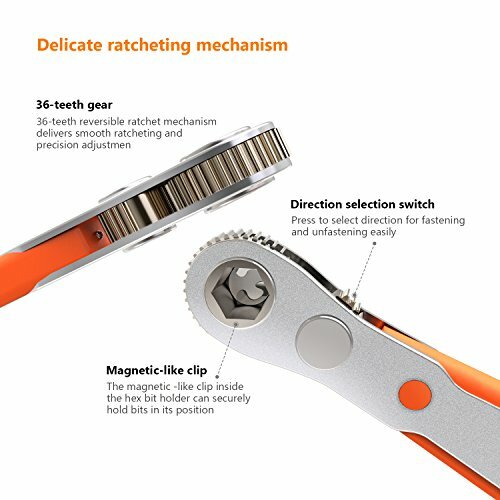 ▲【Reversible Ratcheting Mechanism】 36-teeth reversible ratchet system made of alloy steel, ensuring smooth ratcheting in both directions and precise adjustment. ▲【Magnetic Bit Adaptor】 Magnetic bit adaptor holds any 1/4″ hex bits securely for higher torque. 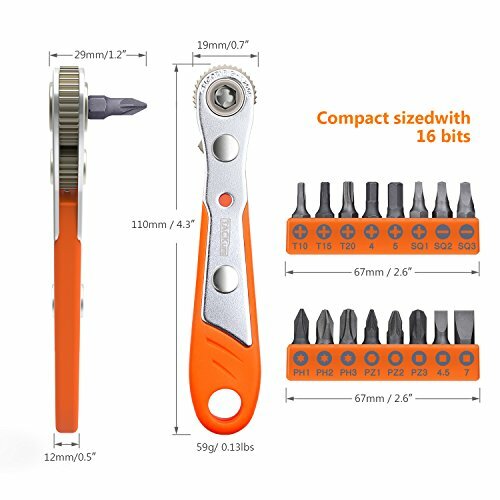 ▲【Extra 16 Popular-size Bits】 3 x Phillips (#1, #2, #3); 3 x Pozi(#1,#2,#3); 2 x Slotted (4.5mm, 7mm); 3 x Torx star (T10, T15, T20); 2 x Hex(4, 5); 3 x Square(1 , 2 , 3). ▲【Wide Application】 Equipped with 16 bits, basically covers common screw specifications for most home devices, saving time and money.